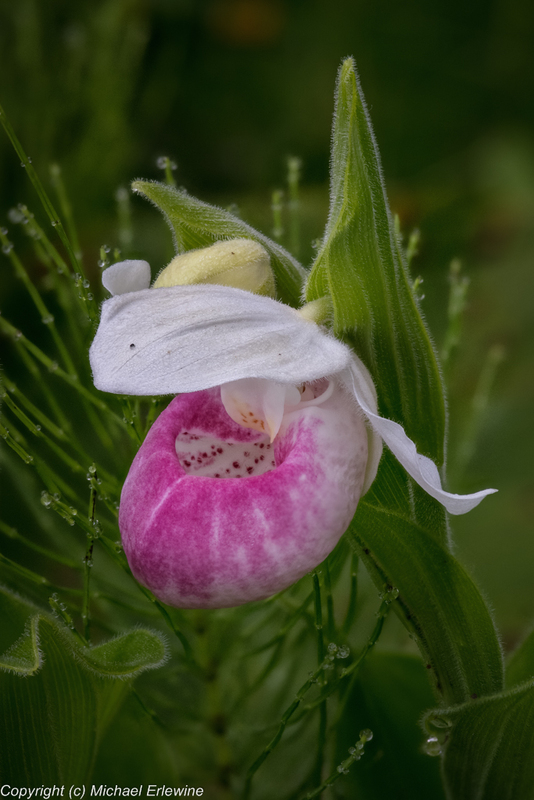 This morning I was out just after dawn exploring a tiny micro-environment here in Michigan, a place where you can find one of the rarer Michigan orchids, in this case the Showy Ladyslipper (Cypripedium reginae), the "Queen." I was trying out my new D7100 to see what it can do. Much to my frustration, I forgot the remote that triggers the camera, so these stacked layers were shot the old-fashioned way, by pressing the shutter-release button, with all of its attendant shaking of the camera. I was not about to drive all the way back to where I live and retrieve it. Therefore this stacking operation is not as smooth as it otherwise might be. What I am finding is that the D7100 is almost a perfect macro and stacking camera, and relatively inexpensive. The only real complaint I have, and it is a big one, is that most of my best macro lenses are already long enough. When I place them on a DX camera they get even longer, and leave me wishing for a wider-angle lens. This is the problem with DX and close-up IMO. Otherwise this little camera does a fine job, all the way round. The lens is the CV-125 APO.